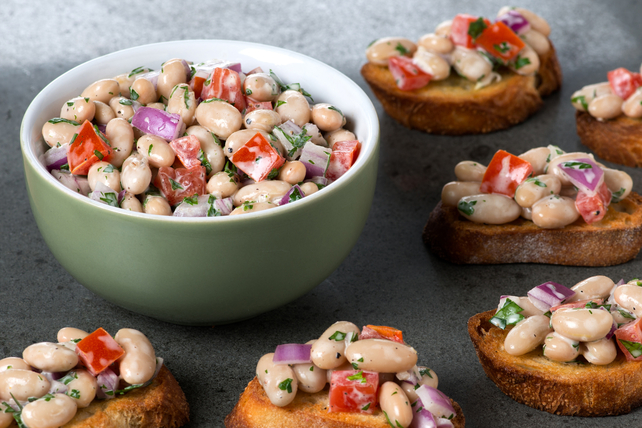 The white bean bruschetta is the perfect topping for the toasted crostini in these delicious, yet easy-to-make, appetizers. Place baguette slices in single layer on parchment-covered baking sheet; brush with oil. Bake 4 to 5 min. on each side or until golden brown on both sides. Remove to wire rack; cool. Meanwhile, combine beans, tomatoes, onions and parsley in medium bowl. Mix dressing, lemon juice and garlic until blended. Add to bean mixture; mix lightly. Spoon bean mixture onto toast slices just before serving. Prepare using Renée's Greek Feta Dressing.